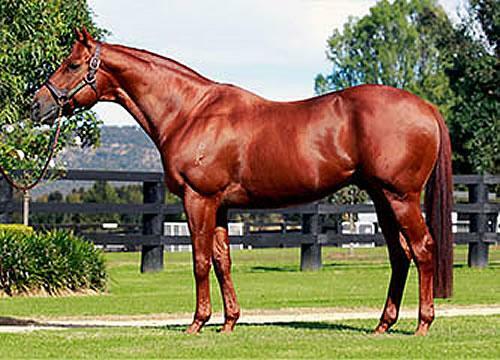 MAGIC ALBERT (AUS) (Chestnut 1998-Stud 2002). 7 wins-4 at 2, STC Peter Pan S., Gr.2. Sire of 685 rnrs, 461 wnrs, 22 SW, inc. Albert the Fat (BRC BTC Cup, Gr.1), Ilovethiscity, Magic Cape, Fighting Warrior, Master Harry, Something Anything, Suyoof, Marchinski - Vital Flyer (H.K. ), Za Magic, Alberto Magic, Orbity, Isopach, Straight Albert, Al be Nimble, Magic Boy, Tweet, Bundle of Joy, Aldini, Ron's Call, Tai Tai Tess, Plain Magic, Alberto, etc. Dark and Stormy. 2 wins at 1400m, 1600m, 2d Hawke's Bay New Year H., 3d Manawatu RC Murphy Properties H.
Taiki Shuttle (g. by Encosta de Lago). Winner at 1800m in Macau. Employed (g. by Encosta de Lago). Placed at 3 in Aust. Undiamo. 2 wins at 1200m, 1300m to 2015-16 in Aust. ZIND - SUPREME (Mal.) (Law Society). 2 wins at 2000m, 2600m in GB and Malaysia, Singapore TC Queen Elizabeth II Cup, L, Ayr Cairnryan S., 3d Doncaster Racing Post Trophy, Gr.1. FIELDS OF ATHENRY (Galileo). 3 wins from 10¾f to 1¾m, €175,955, in 2015, Leopardstown Ballyroan S., Gr.3, Challenge S., L, 2d Down Royal Ulster Derby, 3d The St Leger, Gr.1. SOUVENIR GIFT (Souvenir Copy). 3 wins at 2, US$211,760, Hollywood Landaluce S., Gr.3, Cinderella S., L, 2d Del Mar Debutante S., Gr.1, Del Mar Sorrento S., Gr.3. Producer. DR DEVIOUS (Ahonoora). Second on The 1992 European 3YO Classifications (Intermediate/Long. 6 wins-4 at 2-from 5f to 1½m, £754,122, US$112,000, The Derby, Gr.1, Irish Champion S., Gr.1, Newmarket Dewhurst S., Gr.1, Goodwood Vintage S., Gr.3, Newmarket Superlative S., L, Newbury May S., 2d Irish Derby, Gr.1, Newmarket Craven S., Gr.3, Royal Ascot Coventry S., Gr.3, Newmarket Tattersalls Tiffany Highflyer 2YO S., 4th Breeders' Cup Turf S., Gr.1, York International S., Gr.1. Sire. ROYAL COURT (Sadler's Wells). 3 wins at 1½m, 13¼f, Chester Ormonde S., Gr.3, Haydock July Trophy, L, 3d York Great Voltigeur S., Gr.2, 4th Düsseldorf WGZ Bank Deutschland Preis, Gr.1, Royal Ascot Hardwicke S., Gr.2, Ascot Cumberland Lodge S., Gr.3. Sire. ARCHWAY (Thatching). 3 wins-1 at 2-at 6f, Curragh Greenlands S., Gr.3, Waterford Testimonial S., L, 2d Curragh Tetrarch S., Gr.3, Longchamp Prix du Petit Couvert, Gr.3, 3d Royal Ascot King's Stand S., Gr.2, 4th Prix de l'Abbaye de Longchamp, Gr.1, Curragh MacDonagh Boland S., L. Sire. SHINKO KING (Fairy King). 8 wins from 1200m to 1800m, HK$650,000, 198,029,000¥, Chukyo Takamatsunomiya Hai, Jpn-1, Tokyo Fuji S., L, Nakayama Christmas S., Tokyo November S., 3d Hong Kong International Bowl, Gr.2, Nakayama Sprinters S., Jpn-1, Kyoto Silk Road S., Jpn-3. Sire. DANCING RAIN (Danehill Dancer). Champion 3YO Filly in GB in 2011 (Intermediate/Long). 4 wins from 2000m to 2400m, £366,901, €238,500 in GB and Germany, The Oaks, Gr.1, Düsseldorf Preis der Diana, Gr.1, Ascot British Champions Fillies' & Mares' S., Gr.2, Newbury Robert Sangster Memorial Fillies' S., 2d Newbury Fillies' Trial S., L, 3d Ascot British Champions Fillies' & Mares' S., Gr.2. MAYBE (Galileo). Champion 2YO Filly in Europe & Ireland in 2011. 5 wins at 2, £73,200, €233,475, Curragh Moyglare Stud S., Gr.1, Debutante S., Gr.2, Leopardstown Silver Flash S., Gr.3, Royal Ascot Chesham S., L, 3d The One Thousand Guineas, Gr.1. AWESOME ROCK (Fastnet Rock). 2 wins-1 at 2-at 1300m, 1800m, A$537,220, to 2015-16, VRC James Boag's Symphony S., L, 2d VRC Australian Cup, Gr.1, Sires' Produce S., Gr.2, MRC David Jones Cup, Gr.3. SUZUKA PHOENIX (Sunday Silence). 8 wins from 1200m to 2000m, 447,678,000¥, Chukyo Takamatsunomiya Kinen, Gr.1, Tokyo Shimbun Hai, Gr.3, Hanshin Cup, L, Kyoto Yukan Fuji Hai Ohara S., Hakodate HTB Hai, Mutsuwan Tokubetsu, Kyoto Rakunan Tokubetsu, 2d Hanshin Hankyu Hai, Gr.3, 3d Chukyo Takamatsunomiya Kinen, Gr.1, Kyoto Mile Championship, Gr.1, Tokyo Keio Hai Spring Cup, Gr.2, Hanshin Hankyu Hai, Gr.3, Tokyo Fuji S., Gr.3, 4th Nakayama Sprinters S., Gr.1. Sire.